It is common for carpets to have some kind of pet stain due to pets soiling the carpet, walking and playing on the carpet. It is also common for carpets to have more than one stain or spot due to high traffic, spills, and other types of mishaps. Over time carpets begin to look extremely dirty and ugly due to these stains. 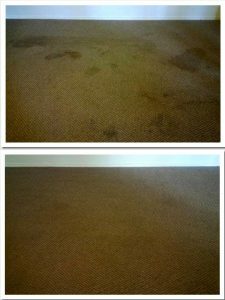 You may not care to have your carpets cleaned after one stain but once the number of stains and spots begin to pill up it is time to call the carpet cleaning experts. Beyer Carpet Cleaning San Antonio has the solutions for those nasty pet stains and smells. Beyer also has the solution for red dye, blue dye, brown dye, oil, ink, paint, and gum removal. We will not only have your carpets looking pretty but they will also be clean and sanitized. If pet stains remain untreated germs and bacteria build up which is unhealthy for you, your family, and friends. Over the counter products such as Resolve or a Rug Doctor will not only leave those stains, germs, and bacteria in your carpet it could leave residues attracting more germs and bacteria and could also damage and fray your carpet. Carpet cleaning San Antonio is serious business so you should only call the experts with the professional equipment to clean and remove pet stains and other types of stains living in your carpet. With our carpet cleaning solutions we guarantee to remove 95% of whatever is in your carpet including dust, dirt, and allergens. Carpet cleaning not only makes your carpets look pretty once again carpet cleaning cleans, sanitizes, and is extremely healthy for you and your family. Beyer Carpet Cleaning is here to help remove those disgusting pet stains without charging an arm and a leg to have it done. Beyer Carpet Cleaning works in the best interest of our customers so call us today to have those pet stains removed.